It’s a time-tested method that will get you mentioned in the press, but do little else. When you can do little else, send a letter and tell the media you sent a letter, and they will tell their readers and viewers. Supporters of Malmstrom should probably start realizing that “Montana’s congressional delegation” has little or no clout with the Department of Defense. The other two missile bases in Wyoming and North Dakota have congressional delegations with more clout to protect them. Plus, Malmstrom has been in the news recently for all the wrong reasons. It’s a smart move for Walsh to show some disagreement with the President. In case you missed it, Sen. Ron Johnson (R-Wisc.) is suing President Obama because he is delaying Obamacare. It’s not that Johnson supports Obamacare; he just does not want Obama using executive orders to tinker with it. He’s sent several e-mails through the Republican National Committee e-mail account about his plans. He wants people to sign his petition, which is basically another way for the GOP to harvest names and e-mail addresses to try and raise money. He also will accept donations. The Democrats do the same thing to get contact information. Personally, I’d like to see Republican AND Democrat politicians live by the same laws as the American citizens they represent. I’d also like to see them work together to make Obamacare better for everyone. 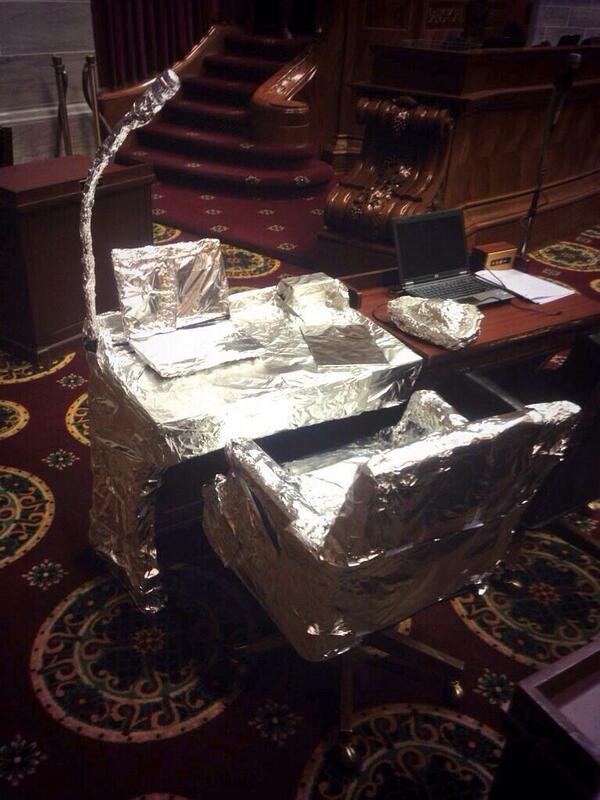 It looks as though he’s serious – check out the photo of his desk/chair HERE. Gallup released the results of their “Well-being index” which takes into account life evaluation, emotional health, work environment, physical health, healthy behaviors, and access to basic necessities. North Dakota, South Dakota, Nebraska, Minnesota, and Montana made the top five, with West Virginia, Kentucky, Mississippi, Alabama, and Ohio being at the bottom. This section is where I mention people or groups whose actions embarrass Montana in some way. Today we have two winners! This is an embarrassment to Missoula. It’s time for the Missoula County Attorney to go. Priest is out on bond and the big thing is he “must stay at least 1,500 feet away from his children, his wife and Trapp.” Judge Blair Jones declined to make Priest wear a GPS monitor. I can only imagine the fear his wife and his daughter feels knowing he is out and roaming free because the Judge Blair Jones failed to do his job. I saw Nugent perform songs off his just released “Cat Scratch Fever” album at Royals Stadium in Kansas City, Missouri in June of 1977 (Yes, I am older than dirt). Nugent was the headliner. REO Speedwagon, Black Oak Arkansas, Head East, Climax Blues Band, and the Little River Band also performed. It was a “Summer Jam” and thousands of people turned out to hear and see the bands – and raise some hell. I remember when Nugent came on stage; it was like someone turned the volume up another 10 notches. It was that freaking loud. My head pounded into the next afternoon – the ringing in my ears did not stop for days. Good times! I saw Nugent in Great Falls, Montana, a few years ago. Let’s just say there were not thousands in attendance. Nugent gets his publicity these days by saying stupid things, like calling our President a “subhuman mongrel.” I did not like it when those on the left called Bush names, and I certainly don’t like for those on the right calling the current President names. They are, after all, our Presidents. This entry was posted in Caught My Eye... and tagged Barack Obama, Jason Priest, John Walsh, Jon Tester, Malmstrom AFB, Missoula County Attorney’, Sen. Ron Johnson, Steve Daines, Ted Nugent, Tinfoil Hats by Jackie M. (Mike) Brown. Bookmark the permalink.